Our founder, Peter Young, and his wife Rose believed in the importance of generosity towards others and their community. With gratitude as our fundamental motivation, the Peter Young Foundation, the Peterson Group Foundation and the Peterson team contribute to the well-being of our diverse community—for today, and the future. We are committed to understanding the needs of our community, to raising awareness for important issues, and to supporting initiatives that make a meaningful difference. We encourage our team members to volunteer in their community, and support them with paid time off to do so. 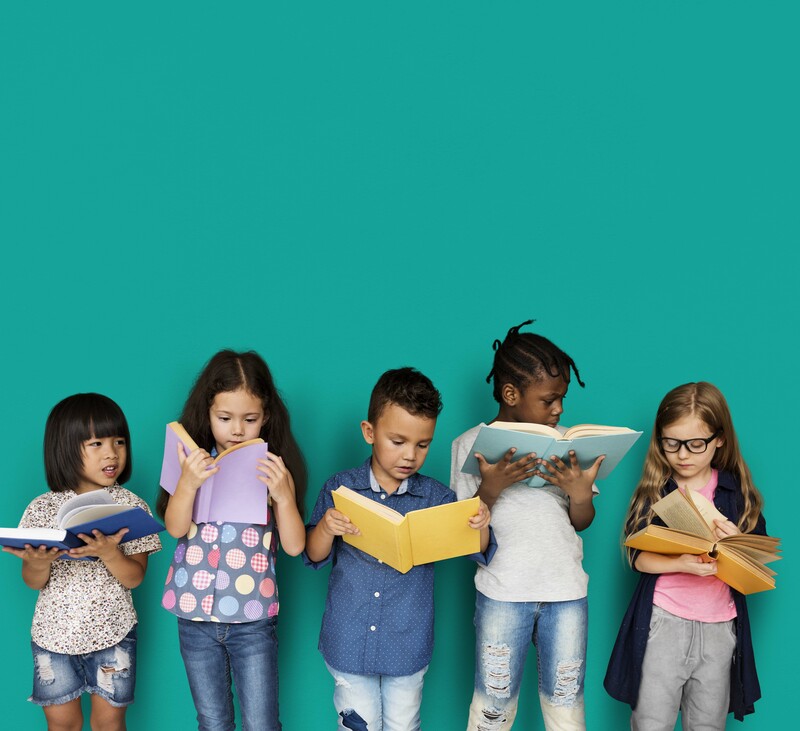 They also have the opportunity to give back to organizations that they have a personal connection to through our employee-directed giving program, where we make a financial donation on their behalf. 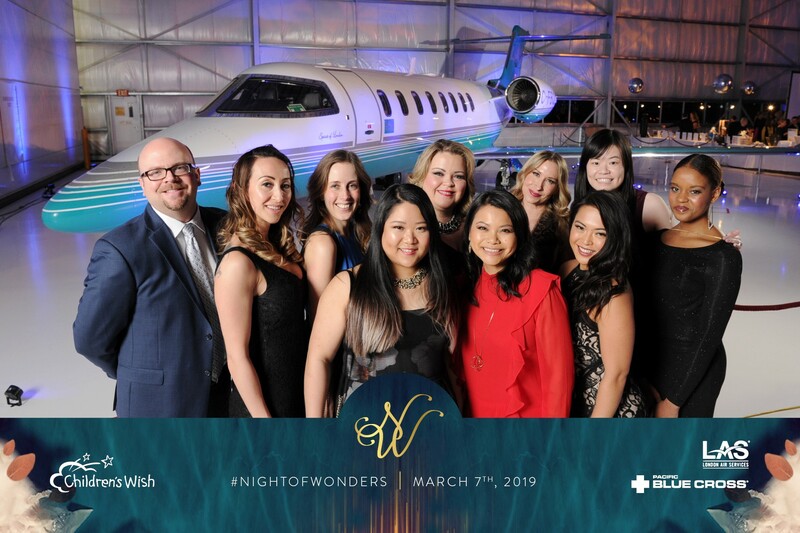 It was a night of wishes come true at the Children’s Wish Foundation Night of Wonders Gala. Thank you Children’s Wish for an inspiring evening celebrating the magic of a wish and the joy and transformation that a wish can bring to a child with a life-threatening illness. The event raised over $550,000 in support of granting the 110 wishes that will be granted to wish kids in the next year. At the 2018 Children’s Wish Foundation Heroes Challenge, our team of 12 won “Best Dressed Team” along with our wish child, Eli. 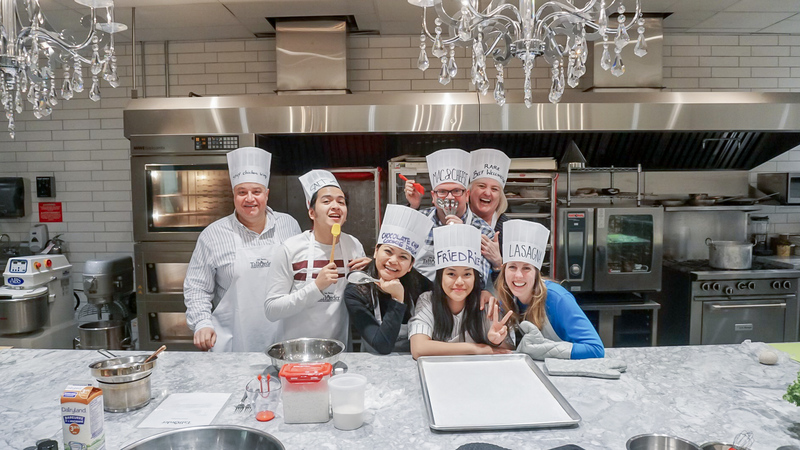 The prize was for eight of our finest chef’s to spend an evening prepping, cooking and enjoying a delicious meal together. A big thank you to the Children’s Wish Foundation and to Tall Order Culinary for this fantastic prize and to everyone who participated with us in Team Eli’s fundraising challenge last year for your incredible generosity and support! Peterson was honoured to return as presenting sponsor for the 24th Annual For Children We Care gala in support of BC Children’s Hospital Sunny Hill Enhancement Initiative. Peterson was honoured to return as presenting sponsor for the 24th Annual For Children We Care gala in support of BC Children’s Hospital Sunny Hill Enhancement Initiative. Peterson volunteers proudly joined the team of volunteers, dedicated staff and gala committee members to help celebrate this very special evening where a record $4,126,888 was raised in support of Sunny Hill. In May 2020, Sunny Hill will relocate to a brand new state-of-the-art facility right on the BC Children’s Hospital campus and is the only children’s rehabilitation facility of its kind in the province—providing assessments, diagnoses, therapy and above all, hope to thousands of kids and families from across the province. Peterson is honoured to give back to the community in deep appreciation for the hospital’s expertise, understanding and care, and in recognition of a special place that has likely touched all of our lives through a loved one needing care at the hospital. 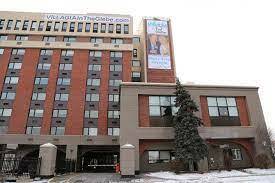 We were once again humbled by the amazing generosity shown in support of pediatric health care in our province. Big Brothers of Greater Vancouver supports child and youth development through volunteer-led mentoring programs. Jared Lo, who works as our Analyst, Investments, has been a volunteer at Big Brothers for the past two years with their mentorship program. We recently made a $2,500 donation to Big Brothers at Jared’s request through our employee-directed giving program to support a cause that he feels passionate about and that also benefits our community. We are happy to support both Jared in his volunteering efforts, and Big Brothers, in the valuable and meaningful work that they do supporting child and youth development. 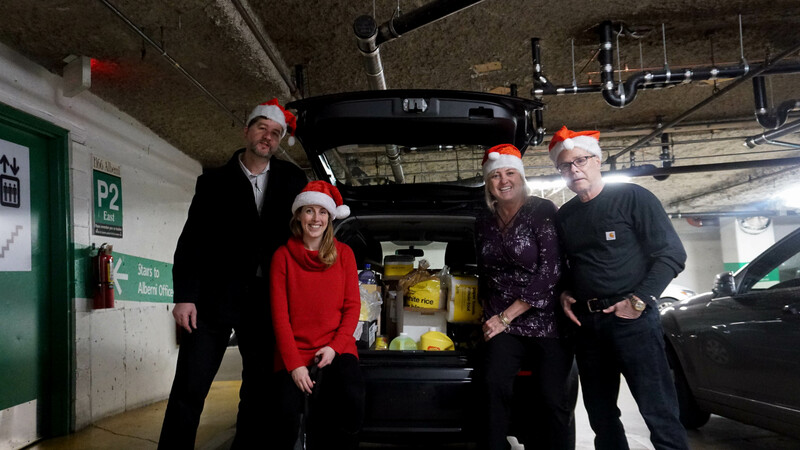 Throughout the month of December, we partnered with our local community including tenants and residents of our commercial and residential buildings for a holiday food drive and matching campaign up to $10,000 in support of the Richmond Food Bank. Collectively, the community raised over $16,000 through cash donations – an amazing 33% increase from last year’s donation collection! 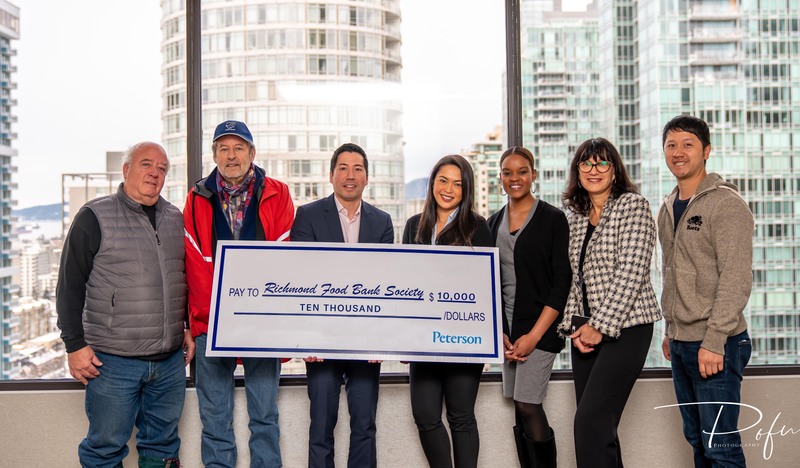 With Peterson’s matching commitment of up to $10,000, this means a collective donation of $26,000 for the food bank and our local neighbours in need, as well as seven very large boxes of food donations that the food bank will distribute to their over 2,200 clients. Now in our seventh year, six of Santa’s elves delivered Christmas hampers to the two very grateful local families in need of a little extra help this holiday season. Each family received enough groceries to last well beyond Christmas as well as some new clothing items for each family member and a special personalized gift. Receiving the names of the families in need from a local school, we are happy to share in the spirit in the season helping to put some extra food on the table and special gifts under the tree for these two families. Happy Holidays! 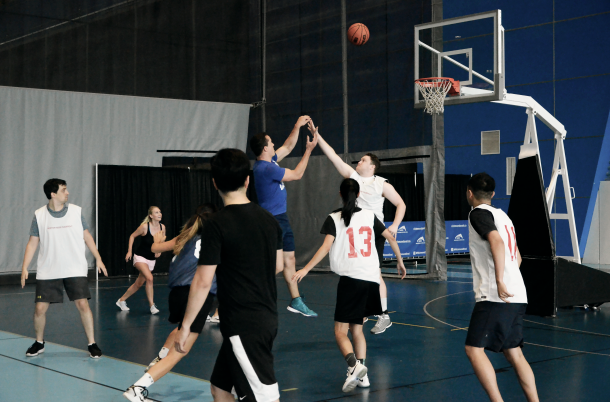 The Hoop-Law Charity Basketball Tournament is an annual one-day fundraising event jointly organized by the Vancouver legal community and UBC law students with fundraising efforts going towards helping children in need who are living in the local community. Chris Jackson, our General Counsel, is a long-time organizer, volunteer, fundraiser and participant of the Hoop-Law event. Chris has helped organize the tournament since 2007 and is a former President of the Hooplaw Society which runs the tournament. On September 8th at the Richmond Oval, over 250 lawyers from more than 25 law firms along with dozens of law students gathered to participate in the tournament raising over $80,000 for the recipient charities from the generous contributions of the Vancouver legal and business communities. Through our Employee Directed Giving Program, supporting Chris’s volunteer efforts and the good work of Hoop-Law participants and organizers, we were happy to make a donation to the 2018 Hoop-Law designated recipient charities: Night Hoops, Aboriginal HIPPY, and the Children’s Hearing and Speech Centre of BC. Congratulations to the Hoop Law organizers and participants on a very successful fundraising event supporting the local community. The Children’s Wish Heroes Challenge is a team challenge event that brings together wish supporters and wish children. Each team is tasked with raising $10,000, the average cost of a wish and on challenge day, teams come together to celebrate fundraising efforts and to compete in challenges designed to test team spirit, mental agility, and physical ability. Team Peterson, aka Eli’s Super Mario All-Stars, joined our wish kid Eli, and his family, for the Heroes Challenge event and had a truly memorable and inspiring afternoon competing against the 14 other teams on event day and raising a collective $180k for Children’s Wish! Challenges including conquering a bouncy castle, a cookie eating competition and a dance off. Team Eli also managed to come away victorious earning the title of “Best Dressed Team”. We’d like to send a very heartfelt thank you to the incredible generosity of everyone who joined with us to help grant our amazing wish kid Eli, his most heartfelt wish, a trip to Disney World with his family, and to the Children’s Wish Foundation for the inspiring work that they do granting wishes to Canadian children between the ages of 3 and 17 who are diagnosed with a life-threatening illness. The Children’s Wish Foundation works with communities across the country to provide children with life threatening illnesses the opportunity to realize their most heartfelt wish. In July, Peterson joined the Heroes Challenge by inviting our partners, friends and family, to join us in raising $10k by Sept 28 to grant our wish child, 10 year old Eli, with his most heartfelt wish – a trip with his family to Disney World. Eli has been battling ALL Hypodiploid Leukemia for just over one year and underwent chemotherapy at BC Children’s Hospital. His prognosis is good and in celebration of his strength, courage and resilience, 6 teams in our office participated in fundraising challenges and together with our local community, we reached our goal of $10k to grant Eli’s wish! On September 28, a team of 12 from Peterson will join Eli for the Heroes Challenge event. Thank you to everyone who partnered with us and for your incredible generosity in support of this heartwarming initiative!! Dress for Success (DFS) is a community empowering women into the workforce by providing them with professional attire, career services, and skills development programs. We packed up the eight bags of donated clothing collected from our in-office clothing drive and dropped them off at the DFS office to kick off an afternoon of volunteering. Natalia, our Director, People & Culture, at Peterson and an active volunteer with DFS for the last eight years, also presented DFS with a donation from Peterson made possible through our employee directed giving program. It was a very rewarding and fun way to spend an afternoon with co-workers doing a small, yet meaningful, part in helping DFS offer long-lasting solutions that enable women to break the cycle of poverty.